Have you run into this problem: you have a list of phone numbers and associated values which would be best shown geographically to see patterns, but there isn’t a clear way to put the data on a map. Maybe you’d like to see a map of customer service calls by call duration or inbound sales by average order size. I wanted to share how to MacGyver a solution with a piece of twine, bubble gum, Excel, and a free online map tool. To me, this is a nice testament to the simple but powerful data visualizations that can be accomplished without programming skills or expensive applications. First I pulled the area codes from my list of phone numbers using the formula below. This simply checks if the phone number starts with 1, then grabs the appropriate three digits for the area code. For my purposes, mapping the phone numbers by state was sufficient. Ideally, we would map the phone numbers to precise latitude and longitude coordinates by doing a reverse lookup of addresses then using the Excel geocoding tool. First I needed a lookup table that could link my list of area codes to states. I wasn’t able to track down a good data table, so I grabbed the data from All Area Codes and cleaned it up. Here is a lookup table of area codes by state. An aside: I have a pet peeve with people who sell data that feels like it should be publicly available. 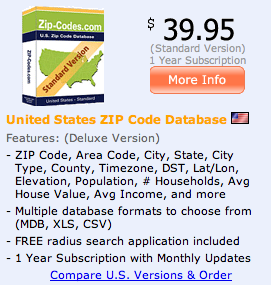 You’ll run across these businesses when looking for basic information about ZIP codes, MSAs, or area codes. Here is an example of one of these parasitic businesses. I used a pivot table to summarize metrics by state. Our friend Ducky Sherwood has generously put together a online tool called Mapeteria that will generate a colorized overlay of US states. In Ducky’s words: "Want to make a choropleth thematic map (i.e. coloured based on your data) for Canadian provinces, U.S. states, or French dÃ©partements?" This overlay can be viewed in either Google Maps or Google Earth. Here’s where it gets a little tricky. You will need to provide Mapeteria with a URL to a properly structured CSV file. Posting a CSV file to a web server isn’t trivial if you aren’t running your own web site. I found one free service called FileDEN that did the job (other suggestions?). Beware all the advertising—and in all likelihood they immediately sold my e-mail address at registration. Nevertheless, you can upload a file here and it will give you a URL which can be used to create your map. We were recently asked to answer some questions about our usage of Google Apps. We’re writing up some business-prosey answers, but poetry is another way of capturing the experience. Here are the questions and our answers in loose haiku. 2) What does your business do? 3) How many people do you employ? 4) Who are your main competitors? 5) Why did you decide to use Google Apps, and why did you choose Google over other commercial or opensource alternatives? 6) What products did it replace and why? 7) Are you using the Standard (free) version or Premier (paid) version and why? 8) Which applications do you use (Gmail, Talk, Calendar, Docs and Spreadsheets, Page Creator….All?) . Which ones give you the most benefit? 9) How many people are using Google Apps and how? How many croaks he hears? 11) What features of the product do you appreciate most and why? 12) What’s been the overall impact of using the Google Apps? 13) Any advice you’d give others in implementing and using Google Apps? 14) Are you using any other Google applications such as Maps? AdWords? AdSense? Please elaborate. 15) What improvements would you like to see in Google Apps that would benefit your business? Care to share your experience with Google Apps? We’ll highlight the best haiku in a later post. Yesterday, Google rolled out new mapping features for Google Earth and Google Maps. Many of these features are behind the scenes in the APIs, but there are great new capabilities that you will start to see. One thing I’m excited about is that KML—Google Earth’s format for building sophisticated map overlays—has come to Google Maps. Google demoed this at their Geo Developer day yesterday using one of our Google Earth overlays that shows US census bureau data by county mapped as a heatmap. It looks like this. Counties are displayed in a list on the left. When you click on a county, you get a nice popup showing statistics for that county. The mapping toolkits provided by Google Maps, Google Earth, and Yahoo Maps beta are well on their way to becoming important business tools once developers figure out how to wire in your enterprise data. 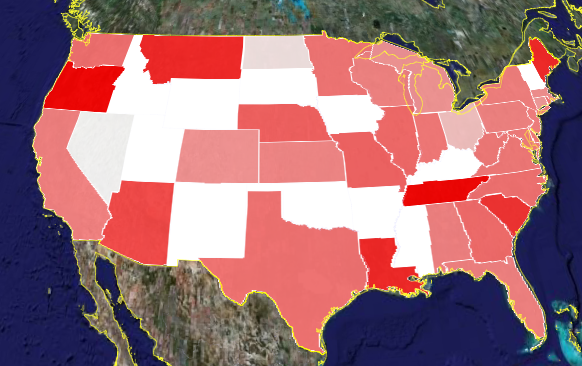 Without further ado, here are some US census data maps for you to explore in Google Maps.